I'm exploring new ways, trying to get a dynamic VDB to a "test" google spreadsheet I've created in my google account. then I reloaded the server, as it was noticed as needed. The VDB deploys fine ("success"), but it stays "loading", and the Summary > error field is filled with "TEIID60000 javax.resource.ResourceException: IJ000453: Unable to get managed connection for java:/googleDS"
11:04:45,824 INFO [org.jboss.as.server] (HttpManagementService-threads - 12) JBAS015865: Replaced deployment "googless-vdb.xml" with deployment "googless-vdb.xml"
For NPE you can open up a JIRA as it is always expecting the username and password in the configuration of the resource-adapter, irrespective of the authentication method. As per workaround you can supply a dummy user name and password for now. Adding Username and Password fields (with real correct values) changes something but I still get an error , unfortunately. "TEIID31080 googleView.GView validation error: TEIID30352 GOOGLE_SOURCE.NATIVE does not exist." Well that is progress, you no longer have a NullPointerException. Now did you add the "SupportsDirectQueryProcedure" translator override property as the document suggests? > Now did you add the "SupportsDirectQueryProcedure" translator override property as the document suggests? I always get a "failed" state and "TEIID31080 googleView.GView validation error: TEIID30352 GOOGLE_SOURCE.NATIVE does not exist"
17:06:22,093 WARN [org.teiid.PLANNER.RESOLVER] (teiid-async-threads - 2) TEIID31080 googleView.GView validation error: TEIID30352 GOOGLE_SOURCE.NATIVE does not exist. 17:06:22,098 INFO [org.teiid.RUNTIME] (teiid-async-threads - 2) TEIID40073 The metadata for the VDB googless.1 is loaded, however it is not valid. Check models for errors. Correct the metadata and re-deploy. Ok, looking at last stack trace I got the error, and now is ACTIVE. Still can't query it in squirrel, because I have to learn the correct data type conversion, but this is another issue... and one mine, not teiid's. 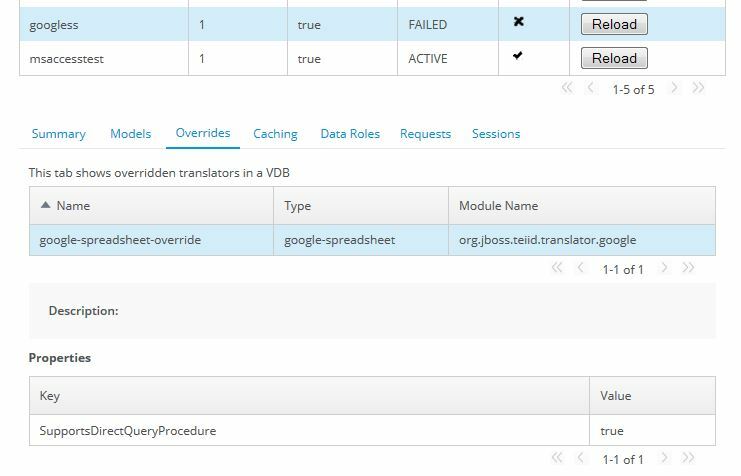 google spreadsheet VDB: I create a view but it doesn't work.